The family of a County Tyrone man shot dead by the SAS has accused British forces of leaking shocking footage of the ambush scene. Graphic video of the aftermath of the attack which claimed the lives of four IRA Volunteers was posted on YouTube but removed last week after complaints were made. 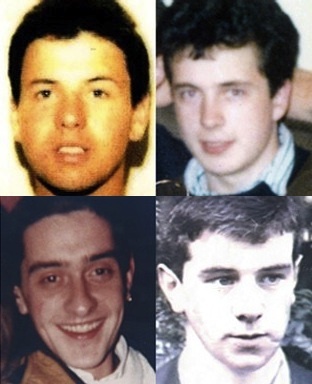 The IRA men - Kevin Barry O’Donnell, Sean O’Farrell, Peter Clancy and Patrick Vincent - were shot dead in the grounds of St Patrick’s Church in Clonoe, County Tyrone, in February 1992. They were ambushed minutes after taking part in a gun attack on Coalisland RUC police base. The Volunteers were the victims of a Crown force shoot-to-kill policy. The video clip, first posted earlier this year, includes closeup images of the IRA men’s remains. It reveals that several of the victims suffered serious head wounds. In one frame the words ‘target vehicle’ also appears on screen beside an image of a lorry used by the IRA men during the incident. Kevin Barry O’Donnell’s sister Roisin Ui Mhuiri spoke of her family’s hurt, saying the four men should be afforded dignity in death. “This is something that was not issued through the coroner’s court. This is obviously something that has been leaked by the Ministry of Defence, British army or PSNI,” she said. Ms Ui Mhuiri said all indications are that the video was taken on the night of the killings, when only the British army and RUC had access to the scene. “The only other person allowed in was a priest to give the Last Rites and he was accompanied throughout,” she said.